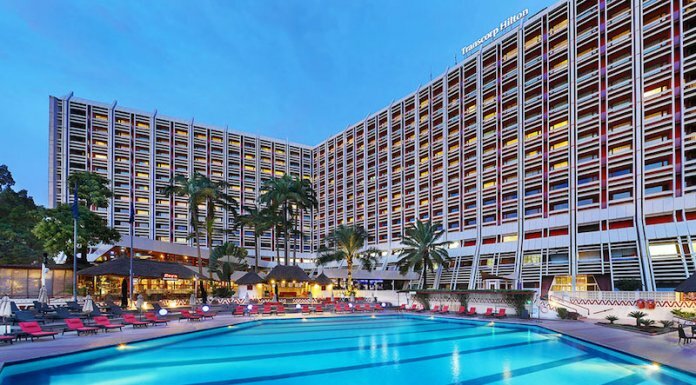 A recent stay at the Transcorp Hilton Hotel Abuja indicates that Nigeriaâ€™s leading hotel refuses to rest on its oars, as it keeps reinventing itself despite being lauded for its achievements across continents. For a guest returning to the hotel for the first time in a year, notable changes are obvious right from the entrance, which has been remodelled for both security and aesthetic purposes. This revamp has been done across the hotelâ€™s 667 rooms and suites, the restaurants, bars and the spanking new Play nightclub. A few weeks ago, the hotel won awards at simultaneous gala ceremonies across two continents; the World Travel Awards held in South Africa and the Seven Stars Luxury Hospitality and Lifestyle Awards hosted in Greece. The prominent World Travel Awards, established in 1993 to acknowledge, reward and celebrate excellence in the sector, have become a key global institution of the industry and is recognised as the ultimate hallmark of quality worldwide. For the fourth year in a row, the Abuja Hilton emerged winner of World Travel Awards in five categories, most notably for Africaâ€™s Leading Business Hotel, Nigeriaâ€™s Leading Hotel and Nigeriaâ€™s Leading Hotel Suite. Itâ€™s not hard to see why the hotel keeps getting accolades. A particularly impressive upgrade to the Transcorp Hiltonâ€™s facilities is not immediately noticeable, but receptionists at the check-in counter are sure to bring the hotelâ€™s new ICE app to your attention. The introduction of the digital guest solution enables guests to control their experiences and engage with the hotel from their personal iOS and Android mobile devices even before they arrive on the property. The app enables the hotel team to improve service and communication with guests. All hotel services including dining options, on-site and off-site recreation spots, concierge services and more are made available on a guestâ€™s personal iPhone, iPad, or Android smartphone or tablet. Guests can access the information needed to personalize a stay anywhere they are (before, during and after a stay), and place requests that are sent directly to appropriate hotel team members. Other services include pre-arrival requests, room service, housekeeping requests, valet services, turn down service, wake up call, do not disturb and more. In practical terms, the app changes the whole hotel experience. For example, youâ€™re at the pool and you need your room service tray picked up, or your room cleaned? Check. Youâ€™re out at a conference but youâ€™ll be back in 30 minutes and you need your food ready and piping hot when you get back? Check. There are so many more benefits, like airline booking and check-in, information on local attractions and of course, feedback. Transcorp Hilton Abujaâ€™s ICEapp, is available for download on Google Play or the App Store. Considering how much time we spend on our personal devices, especially phones, this is an innovation certain to be a hit. In a few months, weâ€™ll all start wondering how we survived without it. While the ICE app is exciting to explore, it isnâ€™t the only new technological addition to the guest experience. The little things matter, like having close to a hundred channels to choose from, including many not on the DSTV bouquet we are used to in Nigeria (I enjoyed watching FOX News). The TV channels also come with a preview feature and information on subsequent programs. There are speakers in the bathroom too, ensuring you miss no voices or sounds, even when you miss visuals. These new upgrades (and more) point to the Transcorp Hiltonâ€™s desire to continually improve, despite being a leader in its industry. Reason why for the third consecutive year, the hotel was presented with Signum Virtutis â€“ a seal of excellence â€“ as the winner of the award Business Hotel (Africa) in Greece, at about the same time it was sweeping awards at the World Travel Awards.